Out of this world first light images emerge from Gemini Planet Imager « Adafruit Industries – Makers, hackers, artists, designers and engineers! Out of this world first light images emerge from Gemini Planet Imager. Gemini Planet Imager’s first light image of the light scattered by a disk of dust orbiting the young star HR4796A. This narrow ring is thought to be dust from asteroids or comets left behind by planet formation; some scientists have theorized that the sharp edge of the ring is defined by an unseen planet. 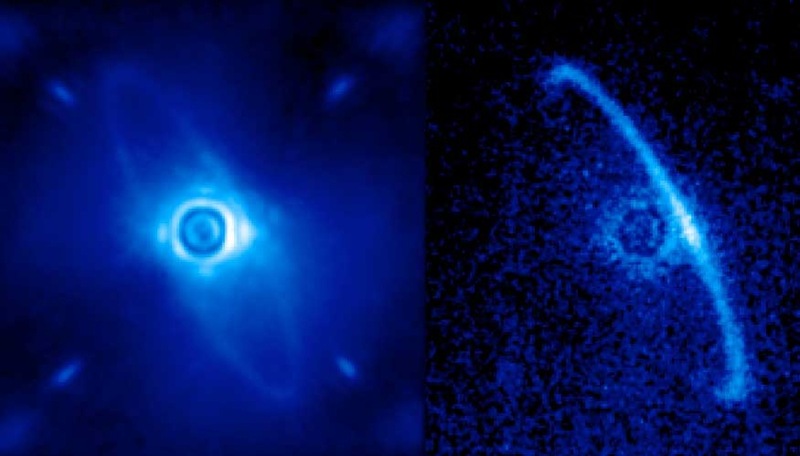 The left image shows normal light, including both the dust ring and the residual light from the central star scattered by turbulence in the Earth’s atmosphere. The right image shows only polarized light. Leftover starlight is unpolarized and hence removed from this image. The light from the back edge of the disk is strongly polarized as it scatters towards us.